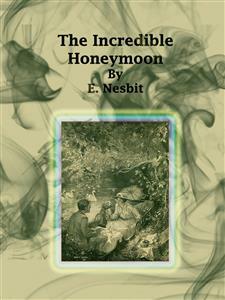 The Incredible Honeymoon written by E. Nesbit who was an English author and poet. This book was published in 1916. And now republish in ebook format. We believe this work is culturally important in its original archival form. While we strive to adequately clean and digitally enhance the original work, there are occasionally instances where imperfections such as missing pages, poor pictures or errant marks may have been introduced due to either the quality of the original work. Despite these occasional imperfections, we have brought it back into print as part of our ongoing global book preservation commitment, providing customers with access to the best possible historical reprints. We appreciate your understanding of these occasional imperfections, and sincerely hope you enjoy reading this book. They sat among the twisted tree roots, and ate and drank and were merry like children on a holiday. TO understand this story you will have to believe in the Greater Gods—Love and Youth, for example, and Adventure and Coincidence; also in the trusting heart of woman and the deceitful spirit of man. You will have to reconcile yourself to the fact that though daily you go to London by the nine-seven, returning by the five-fifteen, and have your accustomed meals at eight, one, and half-past six, there are those who take neither trains nor meals regularly. That, while nothing on earth ever happens to you, there really are on earth people to whom things do happen. Nor is the possibility of such happenings wholly a matter of the independent income—the income for which you do not work. It is a matter of the individual soul. I knew a man whose parents had placed him in that paralyzing sort of situation which is symbolized by the regular trains and the regular meals. It was quite a nice situation for some people, a situation, too, in which one was certain to "get on." But the man I knew had other dreams. He chucked his job, one fine Saturday morning in May, went for a long walk, met a tinker and bought his outfit—a wheel on wheels, a sort of barrow with a grindstone on it, and a pot for putting fire in dangling underneath. This he wheeled profitably through rural districts—so profitably that he was presently able to buy a donkey and a cart, and to sell kettles as well as mend them. He has since bought a gipsy tent; with these impediments—or helps—he travels through the pleasant country. Things are always happening to him. He has found a buried treasure; frustrated a burglary; once he rescued a lady in distress; and another time he killed a man. The background to these dramatic incidents is always the pleasant background of quiet road, blossoming hedgerows and orchards, corn-fields and meadows and lanes. He says this is the way to live. I will write down his story some day, but this is not it. I only bring him in to illustrate my point, which is that adventures do happen—to the adventurous. My friend the tinker has had, perhaps, more than his share of adventures, but then his is the temperament that shoots, like a willing needle, to the great magnet of melodrama. The temperamental needle of Edward Basingstoke followed the magnet of romance. In a gayer, if less comfortable, age he might have been a knight-errant, or, at least, the sympathetic squire of a knight-errant. Had he been born in the days when most people stayed at home and minded their own business he would have insisted on going out and minding other people's. Living in the days of aeroplanes, motors, telegraphy, and cinematographs, in a world noisy with the nonsense of politics and the press, he told himself that the ideal life was the life of the farmer who plowed and sowed and reaped, tended his beasts and filled his barns, and went home from his clean, quiet work to the open hearth whence the wood smoke curled up to heaven like the smoke of an altar. Destiny, in deep perversity, was making an engineer of him. He dreamed his pastoral dreams in the deafening clangor of the shops at Crewe, but not ten thousand hammers could beat out of his brain the faith that life was really—little as one might suppose it, just looking at it from Crewe—full of the most beautiful and delicatepossibilities, and that, somehow or other, people got from life what they chose to take. While he was making up his mind what he should take, he went on learning his trade. And Destiny seemed determined that he should learn nothing else. What we call Destiny is really Chance—and so far from being immutable, she is the veriest flirt and weathercock. She changed her mind about Edward—or perhaps Death, who is stronger than she, insisted and prevailed. Just at the time when a faint dust was beginning to settle on his dreams—the sort of dust that thickens and hardens into clay and you grow cabbages in it—Death intervened to save him. It was his uncle who died, and he left a will, and by that will certain property came to Edward. When the news came he took a day to think of it, and he went to the works as usual that afternoon and the next morning. But next day at noon he laid down his tools and never took them up again. Instead he took a ticket to Oxford, appeared at the rooms of his friend, whom he surprised in slumber, and told his tale. "And you're going to chuck the shop," said the friend, whose name was Vernon Martingale, and his father a baronet. "I have chucked the shop," said Edward. "I chucked it at Fate as you might throw a stone at a dog. And that reminds me—I want a dog. Do you know of a nice dog—intelligent, good manners, self-respecting, and worthy?" "Certainly not. These researches into family history are in the worst possible taste. You don't love me for my pedigree. Why should I love my dog for his?" "I suppose you want some tea, anyhow," said Martingale. So they had tea, and talked cricket. "Any idea what you mean to do?" Martingale asked several times, and at last Edward answered him. "What I mean to do," he said, "is what I always meant to do. I mean to be a farmer, and hunt, and shoot, and grow flowers. I think I shall specialize on sunflowers. They're so satisfying." "More than you are," said Vernon. "Mean to say you're going to buy a farm and ruin yourself the moment you've got a few half-crowns to ruin yourself with?" "I am going to be a farmer," said Basingstoke, "but first I am going to see life." "Life? But you were always so. . . ."
"I mean that"—Edward indicated the sunshine outside—"not getting drunk and being disreputable. I can't think why the deuce-dickens that sort of beastliness is always called seeing life. As if life were all gas, and wining, and electric light, and the things you don't talk about before ladies. No, my boy, I'm going out into the unknown—not into the night, because it happens to be afternoon—and I thought I'd just come and clasp that hand and gaze once into those eyes before I set my foot on the untrodden path of adventure. Farewell, Vernon of Martingale, good knight and true! Who knows when we shall meet again?" "I don't, anyhow," said Vernon, "and that's why you're not going till the day after to-morrow, and why I insist on knowing what you mean by seeing life—and why you're going to stay till to-morrow, anyhow." "Heaven forbid that I should criticize another man's tastes," Edward sighed, "or deprive him of any innocent enjoyment. If you want me to stay—well, I'll stay—till to-morrow. And as for what I mean by seeing life—well, I should have thought even you would have understood that. I'm going to get a stick, and a knapsack, and a dog, and a different kind of hat, and some very large boots with nails, and a new suit, only I shall wear it all night before I wear it all day. Oh, Vernon, can't you guess my simple secret?" "He calls a walking-tour seeing life!" Vernon pointed out. "And who's going with you and where are you going? The Hartz Mountains?—the Carpathians?—Margate?—Trouville? What?" "The person who is going with me," said Edward, "is the dog whom we haven't yet bought. Come along out and buy him. As to where I'm going, I shall follow the most ancient of sign-posts—and I know that I can't go wrong." "That indicator of the place to be,The Heaven-sent guide to beauty and to thee. "Do you know, if you talk rot to the chaps at the works they try to understand what you mean. Like Scotchmen, you know. They think they can understand anything, no matter how shallow. Now I will say for you that you know your limitations. Let's buy the dog, my son, and get a canoe." They did. And the dog upset the canoe. THE Five Bells was asleep; asleep, at least, was the face with which it met the world. In the brick-floored kitchen, out of sight and hearing of the road, the maid was singing as she sluiced the bricks with a white mop; but if she and her mop had been state secrets, matters of life and death, they could not have been more safely hidden from any chance passer. In the bar the landlord was asleep behind the Lewes Gazette and South Coast Journal. In the parlor the landlady was asleep behind a screen of geraniums and campanulas. The ornamental clock on the mantelpiece said, most untruly, ten minutes to eight. Really it was four o'clock, the sleepiest hour in the day. The flies buzzed in the parlor window; in the bar the wasps buzzed in the bottle that had seemed so sweet a bourn to each as it drifted in from the out-of-door heat to the cool darkness of the sanded bar. On the broad, white door-step the old cat slept, his person nicely adjusted to the sun and shade, his flanks in the sunshine and his head in the shadow of the porch. The white blind of the window swelled out, now and then, like a sail, because in this sort of weather one leaves all doors and windows open. In the yard some one had drawn a bucket of water—the brown oak and the brown iron of the bucket were still wet, and still wet the trail it had made where it was carried to the old bath that the chickens drank from. But the trail was drying quickly, and the hens, having had their drink, had gone to sleep in the hollows they had scooped for themselves in the dust of their inclosure. Some one had been chopping wood, for a few chips lay round the block, in which the bill was stuck by its sharp edge. The man who attended to the wood and water was asleep, standing against the ladder that led from the stable to the hay-loft—a convenient position, and, if you were wanted in a hurry, not compromising, as lying down would be. To right and left the road stretched, very white and shining, between dusty hedgerows and scattered cottages whose drawn blinds looked like the eyelids of sleepers. The whole village was asleep, it seemed—only a boy and a dog were awake. The boy had not gone to school because he had torn his every-day trousers on a nail in the stable. To wear his Sunday trousers was, of course, out of the question. And to mend the every-day trousers would take time. So Tommy was put to bed, nominally as a punishment for not looking where he was going—a most unfair implication, for the nail had attacked him in the rear. Children do not go to sleep when they are put to bed as a punishment. They cry, if their spirit has been broken by unkindness; if not, they lie and meditate mischief. Tommy waited till the afternoon silence settled on the house, and then very carefully and slowly crept down the stairs in his nightshirt, dodged Gladys and the mop, and reached the larder. Here he secured a flead-cake, a raisin-cake, and an apple, dodged Gladys again, and reached the back door, where he stood looking out at the yard. It would be silly to go back to bed. Mother would not be awake for a good half-hour yet. There would be time to get to the stable, climb into the loft, and eat his booty there. It would be safer, in one way, and in another more adventurous. He stooped till his head was below the kitchen window and crept by, skirting the walls of the yard till he reached the stable door, and next moment was safe in the half-darkness where the sunlight through the cracks of the door made dusty shafts of radiance. The familiar smell of hay and horses charmed him, as it always did. Ah, there was Robert, asleep as usual. Well, even if Robert woke, he could be trusted not to tell. Tommy climbed into the manger of one of the empty stalls, and just as he got his knee on it some one behind pushed him with sudden and incredible violence. He fell heavily, dropped his plunder, and found himself involved in the enthusiastic embraces of a large, strange, white dog, which in one breathless instant licked his face all over, trampled on his stomach, made two mouthfuls of the flead-cake and the raisin-cake, rolled the apple in the muck of the stable, snorted in a sort of brutal ecstasy, and bolted heavily out into the sunshine. It was too much. The sudden and brutal attack overcame all considerations of prudence. Tommy forgot where he was, and why; the dangers of his situation were nothing beside the outrage of this unprovoked assault and theft. Robert was awakening slowly. If he had been awake before he might have repulsed the enemy. Tommy opened his mouth to howl, but the howl changed to a scream, for there was the dog back again, snuffing loudly in the straw and fawning at Tommy as on an old and valued friend. "Charles!" a stern voice called from the yard, "come here, sir." The dog wagged a muscular tail and grinned at Tommy, as though inviting him to share the joke. The stable door was darkened by a form. Even in the difficulties of repulsing the dog's attention without irritating it, the child found time to be glad that the darkening form was that of a stranger. "Call him off, if he's your dog," Tommy urged, thickly, backing against the manger. "Might as well call him off, sir," Robert—now almost awake—conceded. The stranger stepped forward, a snap clicked, and Charles, still widely smiling, was straining at the end of a leathern thong. "I hope he didn't frighten you," said the stranger. "He bunted at me with his great head," said Tommy, with half a sob, "and then he eat up what I'd got, and hooked it off again afore you could say knife." "Nothing," said Tommy, remembering caution, "at least—"
"The jingling of the guinea heals," said the stranger, incomprehensibly. "Would sixpence be any comfort to you?" Tommy's eyes answered, and the stranger held it out. "Thank you, sir," said Tommy, and added, in close imitation of his father's manner to thirsty travelers, "Going far to-day, sir?" "I was thinking," said the stranger, "of putting up here." "Then," said Tommy, with great presence of mind, "please don't say anything to them about the dog eating—what he did eat—nor me being here in my shirt, nor about Robert being asleep. If you'll go round to the front, sir, you'll find the bar, and that'll give me a chance to slip back to bed, sir, if you'd be so kind." "I see," said the stranger, "you were sent to bed." "In punishment like," said Tommy, "so you see I don't want to. . . ."
"Exactly. An unobserved retreat. I will draw the enemy's fire from the front premises. Come, Charles." Charles obeyed, only pausing to entangle the lead in the handle of a shovel and to bring this down upon the feet of Robert, to upset a sieve of chaff and run between his master's legs with a sudden violence which, but for the support of the door-post, would have thrown him to the ground. "Nice-spoken young man," said Robert. "Now, young Tommy, you cut along back where you belong. I'll be asking Gladys the time to keep her off of the back door while you slips in, you young limb." He strolled across to the window as Tommy's bare feet trod the sun-warmed bricks to the back door. As the child crept up the stairs he heard the stranger's voice in the bar. "Sixpence," said Tommy, in ecstasy, "and him going to put up here." He cuddled down into his bed well satisfied with the afternoon's adventure. Adventures are, indeed, to the adventurous. "If I'd 'a' bin a good boy and stayed in bed nothing wouldn't have happened," was how he put it to himself. Meanwhile the stranger, encumbered by the striving Charles, was "being shown the rooms"—the bare, much-scrubbed bedroom, the all-too-full and too-carpeted parlor. "They are exactly what I want," he said, and so won the heart of his hostess. When Tommy, his trousers restored, came down to tea he was warned not to go clamping about in his boots, because there was a gentleman in the parlor. Tommy fingered the sixpence in his pocket and said nothing; his mouth was, indeed, far too full for words. That evening in the parched orchard behind the house Tommy came edging shyly toward the stranger as he lounged under the trees smoking a fat pipe. "Hullo, young man!" was the greeting. "Come here and talk to me." "Got your trousers back, I see," said the stranger, genially. Tommy admitted it with a grunt. The stranger nodded and took his pipe out of his mouth. "Ever see a pig?" he asked. "I see you have. You speak their language awfully well." The stranger uttered a sound which Tommy recognized and smiled to hear. "That's what the pigs say," said the stranger. "Agreeable little boys who have recovered their trousers say 'Yes' or 'No' when their friends ask them questions. Don't they?" "Oh yes, you do. Because I've told you. Now what would you like to do?" "I can't tell you that you know, because I don't know myself. But I'll put it to you like this: If you can make up your mind to talk the language of agreeable little boys who have recovered their trousers, I am disposed to endure your company and even to assist you in any play you may have in hand. But I can't associate with a person who grunts at me. If you want to grunt, go and grunt at some one who likes it. I don't." "I didn't go for to," Tommy urged. "Handsomely admitted. I accept your apology. You don't know what you'd like to do, I say. Well, is there anything you'd like to have? I'm living the idle life, Tommy, and my hands are beginning to ache for want of something to do. I want to make something. Ever make anything?" "I made a rabbit-hutch, onst," Tommy owned, "but the door warn't straight on her hinges. And I tried a kite—but it stuck to me and come to bits afore ever it was dry." "Look here," said the stranger, sitting up, "what about a kite? I could make you a kite as big as a house or a fire-balloon. Would you like that?" Tommy began a grunt, pretended that it had been a cough, and turned that into, "Yes, please, sir." "We must restrain Charles," said the stranger, turning to the large white dog, who sat with feet firmly planted, smiling a wide, pink smile, "or this kite will certainly stick to him and come to pieces afore it's dry. Where's the shop?" "Down street," said Tommy. "I could pop down street in a minute for the paper and things." "Sure you'd rather have a kite than anything else?" Tommy hesitated, and then said of course he'd rather have a hairyplane, but he supposed the stranger couldn't. To which the stranger startlingly replied, "Oh, couldn't I, my boy! Father got a horse and trap?" he went on. And from that moment the most wonderful four days of Tommy's life moved forward majestically without pause or let. To drive into Eastbourne with the gentleman—rather slow the old horse was, but it was the best trap—to hold the reins outside important and unusual shops, including the Eastbourne Motor-Car Company and the telegraph-office at the station; to be taken to dinner at a fine hotel with flowers in all the windows, and real waiters dressed exactly like the gentlemen who sang at the school concert, white ties and all—or just like the butler at Mr. Ferney's who had the training-stables—and such things to eat as Tommy "never did." The horse and trap were put up at Mr. Pettigrew's Livery and Bait Stables, in itself an act of unheard-of daring and extravagance. And after dinner the stranger got a motor-car—a real private one—none of your red flags and mustn't ride on the front seat, where, in fact, he and the stranger did, with great dash and daring, actually ride. And they went to Pevensy and Hurstmonceau and Hastings, and the stranger told Tommy stories about the places, so that history was never quite itself again to Tommy. Then back to Eastbourne, to call again at the unusual shops, as well as at one of the more usual character, where the stranger bought toffee and buns and cake and peppermint creams; to get a parcel from the station, and so home round the feet of the downs in the pleasant-colored evening, with the dust white on the hedges, and the furze in flower, and the skylarks singing "fit to bu'st theirselves," as Tommy pointed out when the stranger called his attention to the little, dark, singing specks against the clear sky, the old white horse going at a spanking pace. No one would have believed he had it in him, compared to what he was in the morning; and drawing up very short and sharp in front of the porch—no driving into the yard and just calling for Robert—and father himself coming out to take the reins. Oh, that was a day! To the stranger, also, whose name, it will surprise you little to learn, was Edward Basingstoke, the home-coming was not without charm. The day before he had been welcomed as a guest; now he was welcomed as a friend, one who had taken Tommy for an outing and spent money on him like water. Any one could see that from the parcels the child had his arms full of. Robert in the stable, hearing the return, and heartened by the unmistakable attitude of the family, loosened Charles from the taut chain at whose end he had choked all day, and sent him flying like a large white bullet into the bar, where his master was standing. Charles knocked over a table and three glasses, trod on the edge of a spittoon and upset it, and the landlord said it didn't matter! Could any reception have been more warmly welcoming? It charmed Edward so much that he said, "When Tommy's face is washed, might he have tea with me to finish up the day?" And this, too, happened. And after tea, when Charles had been partially calmed by five whole buns, eaten in five eager mouthfuls, they undid the parcels, and Tommy reveled in the tools and metals, the wood, the canvas, the dozen other things he knew neither the names nor the uses of. And when it was time to say good night and they had said it, Tommy wanted to say something else. He stood by the parlor door, shuffling his boots and looking with blue, adoring eyes at the stranger. "I say," was still all that Tommy said. "Yes, I hear you do. But what?" "I'm right-down glad you come here to stay, instead of going on to Wilmington, like what you might have," was the most Tommy could do. Then he added, after a fierce, brief struggle between affection and shyness: "I do take it very kind, sir—and the peppermints, and all. Good night, sir." It was the happiest day Edward had spent since he left Crewe. And next day they began to make the aeroplane. I do not know how toy aeroplanes are made. There may be a hundred ways of making them. If there are, Mr. Basingstoke knew at least one of these ways, and it was quite a good way, too. The village carpenter and the village blacksmith each was visited—I know that—and a good deal of the work was done at the carpenter's bench. And at the end of the third day the toy was ready. "We'll fly it in the morning," said Mr. Basingstoke. "Are you glad it's done? Sure you wouldn't have liked a kite better?" "Not by long chalks," was Tommy's fervent answer. The little aeroplane sat on the little stand the carpenter had made for it, shiny with varnish, white with canvas, glittering in all its metal mysteries. "Jiminy!" said Tommy, awe-stricken at his own good fortune, "I didn't know anybody could be so clever as what you are." Edward Basingstoke, as he went to bed, wondered whether, after all, he could spend his money to any better purpose than going about the country making aeroplanes to please little boys. WHEN you have made an aeroplane, the next thing is to make it fly. And however agreeable an admiring audience may be while one is fiddling with definite and concrete objects of wood, canvas, and metal, one is apt, for the flight itself—the great flight, the flight by which the aeroplane shall stand or fall—to desire solitude. That was why Edward drew the yellow blind up and the dimity curtain aside and turned his bed round, so that the sun at its first rising should strike through his dreams and awaken him. The sun did exactly what it was expected to do, and Edward awoke saying "Bother" before he remembered that "Bother" was not at all what he meant. Then he got up and splashed gently, so as not to break the audible sleep of the people in the next room, stole down the creaking, twisted stairs in his tennis-shoes, soft-footed as a cat, drew the bolts of the back door, and slipped out, closing the door noiselessly behind him. He was careful to draw the bolt into its place again by means of a bit of fishing-line. You can do this quite easily with an old door that does not fit very closely—if you are careful to mark with chalk on the outside of the door, as Edward did, the exact place where the bolt is. Having thus secured the door against passing tramps or burglars, he went out across the highroad, soft with thick, white dust, where the dew lay on hedge and grassy border, and the sun made diamonds of the dew. Charles, choking himself in the stable, grew faint with distance. Beyond the village was a meadow suited to his needs. It was bordered on one side by a high red-brick wall, above whose moss-grown coping the rounded shapes of trees leaned. A wood edged it on two other sides, and in the front was a road. Here he made his preparations, wound up his machine, and, after one or two false starts, got it going. He meant to fly it like a kite, and to this end he had tied one end of a ball of fine twine to the middle of its body. Now he raised it above his head and launched it. The little creature rose like a bird; the ball of string leaped and jumped between his feet, as he paid out the line; the whirring wings hung poised a second, at the level of the tree-tops, and then, caught by the wind, sailed straight toward the red wall, burrowed into the trees, and stopped. He ran toward the wall, winding up the string, and stood below, looking up. He could not see the winged loose thing. He tweaked the string and his tweak was met with uncompromising resistance. The aeroplane had stuck in a chestnut-tree, and hung there, buzzing. Edward measured the wall with his eye. It was an old wall, of soft red brick, from which the mortar had fallen away. In its crannies moss grew, and ragged-robin and ground-ivy hung their delicate veil in the angles of its buttresses—little ferns and wall-flowers run to seed marked its courses, the yellow snapdragon which English children call toad-flax flaunted its pure sulphur-colored plumes from the ledge below the coping. An architect would have said that the wall wanted pointing; a builder would have pointed it—an artist would have painted it. To an engineer in grief for a lost toy the wall presented itself as an obstacle to be climbed. He climbed it. He thrust the string into his jacket pocket, and presently set hand and foot to the hold that the worn wall afforded. In half a minute he was astride the coping; next moment he had swung by his hands and let himself go on the wall's other side. It was a longer drop than he expected; it jarred him a little, and his hat tumbled off. As he picked this up he noticed that the wall on the inside had been newly pointed. The trees were a good thirty feet from the wall. There would be no getting back by the way he had come. He must find a gate. Meantime the little aeroplane's buzzing had grown faint and ceased. But the twine led him to the tree, as the silken clue led Queen Eleanor to the tower of Fair Rosamond. The next thing was to climb the tree and bring down the truant toy. The park spread smooth and green before him—the green smoothness that comes only to English grass growing where grass has been these many years. Quiet trees dotted the smooth greenness—thickening about the house, whose many chimneys, red and twisted, rose smokeless above the clustered green. Nothing moved in all the park, where the sun drank the dew; birds stirred and twittered in the branches—that was all. The little aeroplane had stopped its buzzing. Edward was moved to thank Fate that he had not brought Charles. Also he was glad that this trespass of his had happened so early. He would get down the aeroplane and quietly go out by the lodge gate. Even if locked, it would be climbable. The chestnut-tree, however, had to be climbed first. It was easy enough, though the leaves baffled him a little, so that it was some time before he saw the desired gleam of metal and canvas among the dappled foliage. Also, it was not quite easy to get the thing down without injuring it, and one had to go slowly. He lowered it, at last, by its string to the ground from the lowest branch, then moved along a little, hung by his hands, and dropped. He picked up the toy and turned to go. "Oh!" he said, without meaning to. And, "I beg your pardon," without quite knowing what for. Because, as he turned he came face to face with a vision, the last one would have expected to see in an English park at early day. A girl in a Burmese coat, red as poppies, with gold-embroidered hem a foot deep. Her dress was white. Her eyes were dark, her face palely bright, and behind her dark head a golden-green Japanese umbrella made a great ridged halo. "I beg your pardon," said Edward again, and understood that it was because he was, after all, trespassing. "I should think you did," said the vision, crossly. "What on earth do you mean by it? How did you get in?" Edward, standing a little awkwardly with the aeroplane in his hands, looked toward the wall. "I came over after this," he said. "I'm very sorry. I was flying the thing and it stuck in the tree. If you'll tell me the way to the lodge, I'll—I hope I didn't scare you." "I couldn't think what it was," she answered, a little less crossly. "I saw the tree tossing about as if—as if it had gone mad." "And you thought of dryads and hastened to the spot. And it was only an idiot and his aeroplane. I say—I am sorry—"
"You can't help not being a dryad," she said, and now she smiled, and her smile transformed her face as sunlight does a landscape. "What I really thought you were was a tramp. Only tramps never climb trees. I couldn't think how you got in here, though. Tramps never climb walls. They get in sometimes through the oak fence beyond the plantations." "It was very intrepid of you to face a tramp," he said. "Oh, I love tramps," she said; "they're always quite nice to you if you don't bully them or patronize them. There were two jolly ones last week, and I talked to them, and they made tea out in the road, you know, and gave me a cup over the fence. It was nasty." She shuddered a little. "But I liked it awfully, all the same," she added. "I wish I were a tramp." "It's not a bad life," said he. "It's the life," she said, enthusiastically. "No ties, no responsibilities—no nasty furniture and hateful ornaments—you just go where you like and do what you like; and when you don't like where you are, you go somewhere else; and when you don't like what you're doing, you needn't go on doing it." "Those are very irresponsible sentiments—for a lady." "I know. That's why I think it's so dull being a woman. Men can do whatever they want to." "Only if they haven't their living to earn," said Edward, not quite so much to himself as he would have liked. There was a little pause, and then, still less himself, he blundered into, "I say, it is jolly of you to talk to me like this." She froze at once. "I forgot," she said, "that we had not been introduced. Thank you for reminding me." Edward's better self was now wholly lost, and what was left of him could find nothing better to answer than, "Oh, I say!" "What I ought to have said," she went on, her face a mask of cold politeness, "is that you can't possibly get out by the lodge. There are fierce dogs. And the lodge-keepers are worse than the dogs. If you will follow me—at a distance, for fear I should begin to talk to you again—I'll show you where the gardener's ladder is, and you can put it up against the wall and get out that way." "Couldn't I get out where the tramps get in?" he asked, humbly. "I don't like to trouble you." "Not from here. We should have to pass close by the house." The "we" gave him courage. "I say—do forgive me," he said. "There's nothing to forgive," said she. "Oh, but do," he said, "if you'd only see it! It was just because it was so wonderful and splendid to have met you like this . . . and to have you talk to me as you do to the other tramps." "You're not a tramp," she said, "and I ought not to have forgotten it." "But I am," said he, "it's just what I really and truly am." "Come and get the ladder," said she, and moved toward the wall. "Not unless you forgive me. I won't," he added, plucking up a little spirit, "be indebted for ladders to people who won't forgive a man because he speaks the truth clumsily." "Come," she said, looking back over her shoulder. "No," he said, obstinately, not moving. "Not unless you forgive me." "It can't possibly matter to you whether I forgive you or not," she turned to say it. And as she spoke there came to Edward quite suddenly and quite unmistakably the knowledge that it did matter. Sometimes glimpses do thus suddenly and strangely come to us—and that by some magic inner light that is not reason we know things that by the light of reason we could never know. "Look here," he said. "I'll go after that ladder in a minute. But first I've got something to say to you. Don't be angry, because I've got to say it. Do you know that just now—just before I said that stupid thing that offended you—you were talking to me as though you'd known me all your life?" "You needn't rub it in," she said. "Do you know why that is? It's because you are going to know me all your life. I'm perfectly certain of it. Somehow or other, it's true. We're going to be friends. I sha'n't need to say again how jolly it is of you to talk to me. We shall take all that as a matter of course. People aren't pitchforked into meetings like this for nothing. I'm glad I said that. I'm glad you were angry with me for saying it. If you hadn't I might just have gone away and not known till I got outside—and then it would have been a deuce and all of a business to get hold of you again. But now I know. And you know, too. When shall I see you again? Never mind about forgiving me. Just tell me when I shall see you again. And then I'll go." "You must be mad," was all she could find to say. She had furled her sunshade and was smoothing its bamboo ribs with pink fingers. "You'll be able to find out whether I'm mad, you know, when you see me again. As a matter of fact—which seems maddest, when you meet some one you want to talk to, to go away without talking or to insist on talk and more talk? And you can't say you didn't want to talk to me, because you know you did. Look here, meet me to-morrow morning again—will you?" "You'll be sorry if you don't. We're like two travelers who have collected all sorts of wonderful things in foreign countries. We long to show each other our collections—all the things we've thought and dreamed. If we'd been what you call introduced, perhaps we shouldn't have found this out. But as it is, we know it." "Speak for yourself," she said. "Thank you," he said, seriously. "I will. Will you sit down for ten minutes? This tree-root was made for you to sit down on for ten minutes, and I will speak for myself." "I can't," she said, and her voice—there was hurry in it, and indecision, but the ice had gone. "You must come at once for that ladder. It's getting more dangerous every moment. If any one saw you here there'd be an awful row." "Yes, for me. Come on." He followed her along the wall under the chestnuts. There was no more spoken words till they came to the ladder. Then, "Right," he said. "Thank you. Good-by." And set the ladder against the wall. "Good-by," said she. "I'll hand the aeroplane up to you?" "Stand clear," he said, half-way up the ladder. "I'll give it a sideways tip from the top—it'll fall into its place. It's too heavy for you to lift. Good-by." He had reached the top of the wall. She stood below, looking up at him. "There won't be any row now?" "Then have you nothing to say?" "Nothing. Yes, I have. I will come to-morrow. You'll misunderstand everything if I don't." She came up the ladder, two steps, then handed him his toy. Then the ladder fell with a soft thud among the moss and earth and dead leaves; his head showed a moment above the wall, then vanished. He went thoughtfully through the dewy grass, along the road, and back to his inn. Tommy met him by the horse-trough. "You been flying it?" he asked, breathlessly. "Yes. She went like a bird." "How far did she go?" Tommy asked. "I don't quite know," said Edward, quite truly, "how far she went. I shall know better to-morrow."